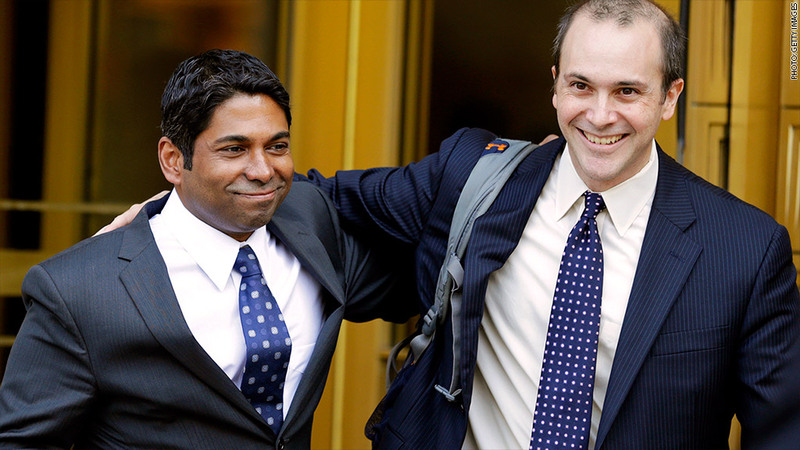 Rengan Rajaratnam (left) was acquitted Tuesday of insider trading charges connected with his work at his older brother's hedge fund. Rengan Rajaratnam won't be following in his older brother's footsteps after all. The younger Rajaratnam was cleared Tuesday of insider trading charges connected with his work at his brother's hedge fund, Galleon Group. U.S. Attorney Preet Bharara has led a crackdown on insider trading, bringing a number of high-profile cases in recent years. The defeat on Tuesday is his first after 85 other defendants have either been convicted or pleaded guilty. That list includes Michael Steinberg, a former trader at Steve Cohen's SAC Capital, who was sentenced in May to more than three years in prison. Bharara issued a statement that said he is disappointed with Tuesday's verdict but that his office will "continue to seek justice in the investigation and prosecution of those who violate the securities laws of the United States." Raj Rajaratnam, the older brother, was convicted on 14 counts of insider trading in May 2011, accused of reaping $64 million in ill-gotten gains. He was sentenced to 11 years in prison, a record for insider trading, and fined nearly $93 million.